I’ve accidentally discovered the answer to the invasion of the brown marmorated stink bugs, which threaten to eat our tomatoes, corn, soybeans, raspberries, apples, and who knows what else this summer. Yes, while scientists of the United States Department of Agriculture are studying the possibility of releasing a small Asian wasp that will parasitize the eggs of the stink bugs, I’ve found a solution that apparently is 100% effective and has no environmental effects—no imported insects to release, no pesticide residues, no nothing, to use the vernacular. I discovered the miracle remedy at the High’s Shell station in Glenelg, a town that I love because I was always a tad backward at spelling, and Glenelg is my kind of word. Yes, one way it’s Glenelg, and the reverse is glenelG. But I digress. When I was on my way back from picking up a load of compost at the Howard County Recycling Center, I pulled into the High’s station to fill up my Tacoma. The photo tells the story. I filled the tank with 15.761 gallons of regular for a total of $57.35, which was after a $3.15 discount (20¢ a gallon) from the Giant Foods Bonus Card savings program. Yes, that total is correct: $57.35. And note that just below the figures are five dead stink bugs that seem to be permanently entombed between the digital readout and its protective glass. 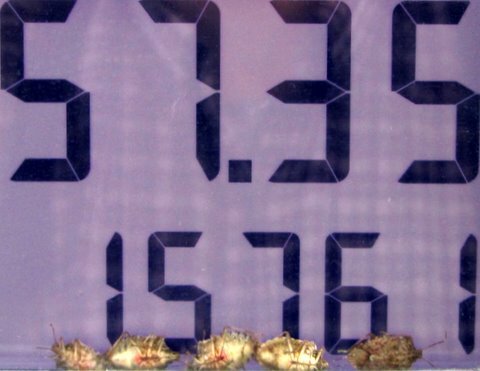 I have no doubt the stink bugs died of cardiac arrest when they saw the price of gasoline. What a discovery! Perhaps our veggies and fruits can be saved without importing predators or polluting our foods with pesticides! Now all we have to do is to figure out a way to march all the stink bugs past gas stations. That might be quite a challenge, but perhaps the USDA researchers can solve that problem too. WARNING: This was attempted humor. ← Dandelions: Weeds, food, cancer killers?